It had been awhile since I’d perused Bite Me, a sassy recipe book that has yielded such favourites as Tortilla Chicken with Avocado Dip. 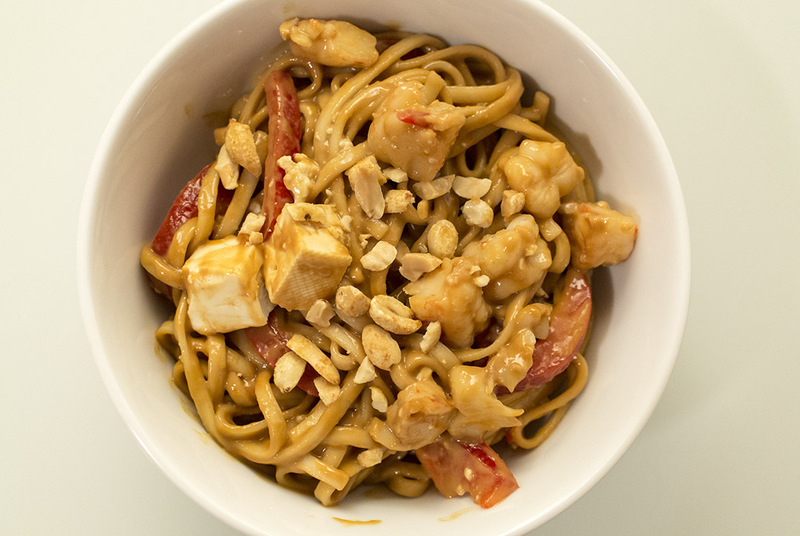 David and I are both fans of peanut sauces generally, and the idea of an easy noodle peanut sauce recipe, that looked to be great for leftovers as well, seemed appealing on a weeknight after a long day. For the sauce, in a small saucepan, whisk peanut butter, hoisin, lime juice, soy sauce and brown sugar. Bring to a boil over medium heat, stirring often. Remove from heat and set aside to cool. Place noodles in a large heatproof bowl and cover with boiling water. Let stand for 3 minutes and gently loosen noodles. Drain well. In a large bowl, toss noodles with peanut sauce, shrimp, tofu, red peppers and snow peas. Garnish with peanuts, parsley and sesame seeds. Serve at room temperature or chilled. A few notes on preparation: We didn’t have lime juice so we substituted lemon juice. We also used dried udon instead of fresh. We also didn’t include the snow peas or the garnishes (though we did crush some salted dry roasted peanuts and sprinkled them on top). For a relatively quick and easy weeknight meal, this was quite tasty. I was a bit worried that the hoisin would overpower the peanut butter, but they balanced each other out quite nicely. D wasn’t sure if he liked the room temperature/cold style of serving, but I quite enjoyed it. It was an interesting change of pace. I could see the addition of honey-roasted peanuts as adding a nice sweetness to the mix. The snow peas would also add a lovely bit of a colour with the red bell peppers. Otherwise, the fact that it can be served cold makes them an easy lunch leftover option.